Sulect: Implementation of Govt. 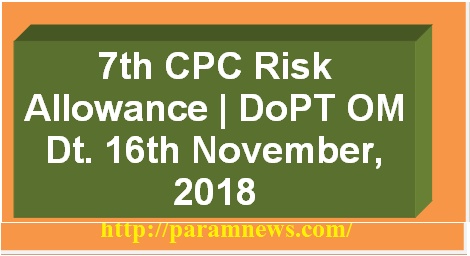 Decision on 7th CPC recommendations on Risk Allowance- reg. The undersigned is directed to say that as per the Ministry of Finance's resolution's dt 06/07/2017 (S No 142), Government of India has decided to retain the Risk Allowance on the implementation of the recommendation of 7th CPC The Government has also decided to calculate the rates of Risk Allowance by multiplying the existing rates by 2.25 factor.